One year after Hurricane Maria devastated the island of Dominica, things are looking better. Debris and roads have been cleared and homes are being rebuilt. Hospitals, schools and government buildings are getting new hurricane-resilient roofs and electricity is back on. Days after the hurricane, EWB-USA engineers were on the ground contributing to the recovery efforts. To date, we’ve trained more than 100 government workers to assess 30,000 structures, and revised building codes to standards that can withstand the next hurricane. Our volunteers’ work providing technical assistance continues. 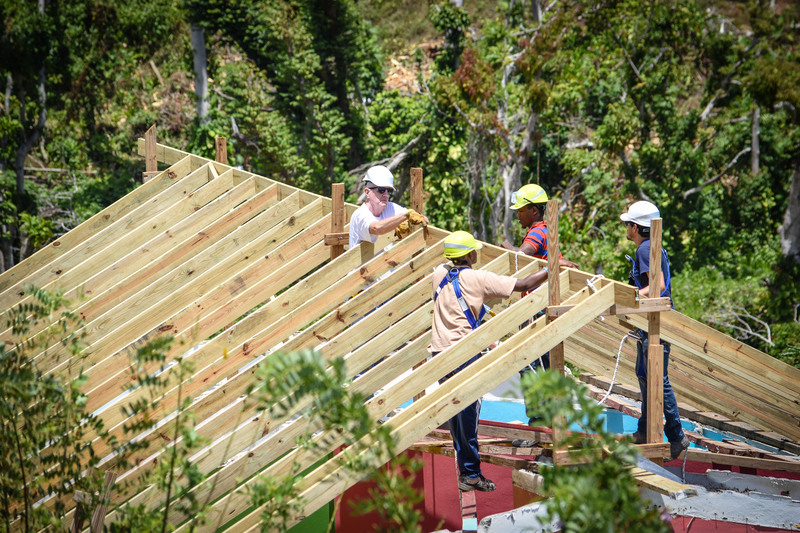 We caught up with EWB-USA engineers Mike Paddock, Jim Curren and Kevin Hagen to discuss their work and time in Dominica. Together, they have almost a century’s worth of experience engineering solutions in difficult environments and have spent hundreds of hours helping Dominica recover. They are part of a team of 20 seasoned EWB-USA volunteers working to rebuild the island. All it takes is a storm warning to bring back vivid memories of the fury Maria unleashed one year ago. In the dark of night on Sept. 18, 2017, Hurricane Maria bore down on the tiny Caribbean island of Dominica. Moving from a tropical storm to a Category 5 hurricane in 24 hours, Maria slammed into the island with 160-mile-per-hour winds that damaged or destroyed roofs on an estimated 90 percent of the buildings, felling power lines and trees and triggering landslides. The human toll was also immense, with 31 people killed and thousands left homeless. The 29 by 16 mile island is often referred to as “Nature Island” because it features dozens of waterfalls, hot springs, rainforests and three national parks—one of which is a UNESCO World Heritage site. This lush setting was plunged into ruin in a single night. 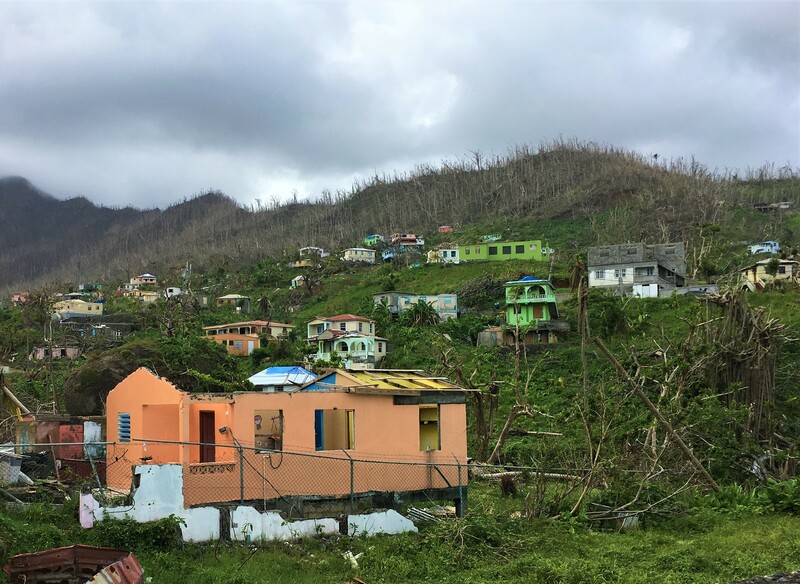 The World Bank estimated damage to the island at over $1.37 billion, which is more than double its gross national product. EWB-USA engineers Kevin and Mike arrived on the scene within days of the hurricane. Despite having done serious disaster recovery work across the globe, neither had encountered a scene like that in Dominica. Mike says that Dominicans frequently refer to the hurricane as “Maria the Exposer” because when the wind stripped the leaves off trees, people could see parts of the island they had never seen before and building practices that simply “weren’t good enough” were also laid bare. In those first few weeks others might have seen only desolation, but our engineers saw opportunity. Not just to build back, but to build back better. “When you first fly in you are overwhelmed by the damage. 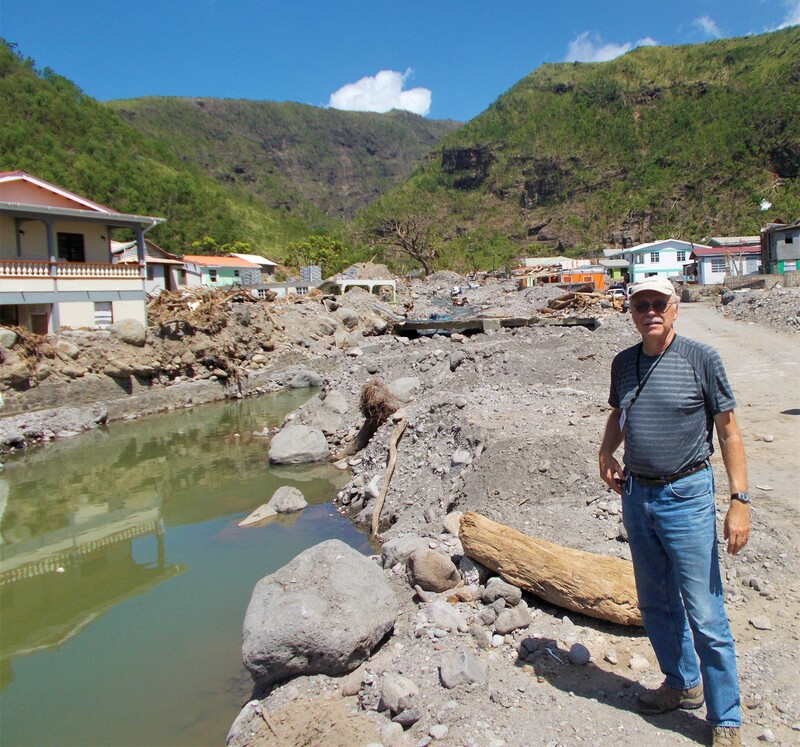 You have to figure out where to begin,” says Jim, who spent nine months in Dominica supporting the recovery effort. As a first step, teams of engineers and assessors trained by EWB-USA assisted in conducting a rapid assessment of roads and bridges. Using software and tablets donated by Microsoft, the teams set off across the island on bike and on foot. They made their way through uprooted trees and rubble, looking for houses on once-familiar roads that were now so washed out they could no longer be identified, to collect crucial information. Photos of structures and household information were geo-referenced and analyzed in real time, ensuring that the island’s recovery plan was based on the best available and most up to date information. In just over three months, 30 teams inspected approximately 30,000 structures across the country. Using this inspection data, engineers were able to identify typical building failures and undertake a comprehensive revision of the Dominica Housing Standards. According to Kevin, the creation of new structural guidelines is EWB-USA’s greatest contribution to the island’s reconstruction efforts. 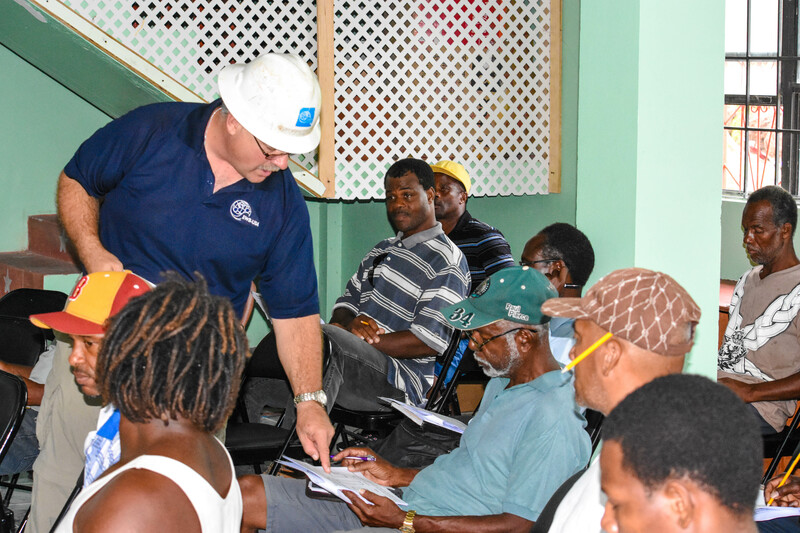 To date, 350 contractors have been trained in “build it back better” techniques, 3,000 Dominica Housing Standard guides have been distributed, and over 1,250,000 have been downloaded. Upon learning that he’d need to conduct trainings on this critical assessment work, Kevin immediately thought about creating a PowerPoint. He then realized there would be no power, no lights and no Internet connectivity. Correcting course, he went “old school” and returned to basics: pen and paper, hand-drawn diagrams, models and a lecture. Improvisation and flexibility would become familiar tropes for Kevin, Mike and Jim. Through a United Nations Development Program partnership with EWB-USA, four hundred local builders received training in resilient reconstruction techniques. Beyond that, EWB-USA engineers also trained community members on these practices. This was particularly important, since the primary source of employment on the island is tourism and associated hospitality jobs—industries that hit a standstill after the hurricane struck. As for spreading the message of building back in more resilient ways, the EWB-USA team celebrated leveraging the island’s annual Carnival as only engineers could: they built a model of a hurricane-resistant roof and paraded it through the streets. Mike Paddock conducts a training. 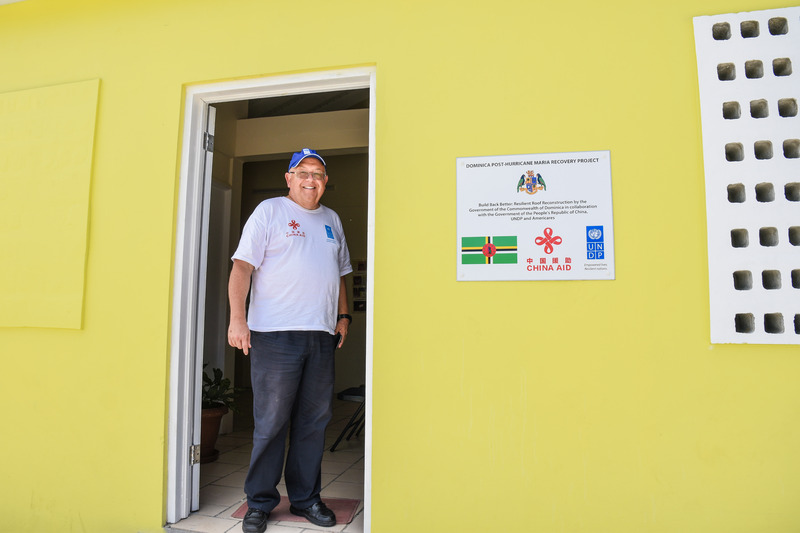 “Dominica still has a long way to go in its reconstruction efforts nearly a year on, but the country is now on a steady path to recovery,” says Lucien Blackmoore, Dominica’s Permanent Secretary for the Ministry of Housing and Lands of the Commonwealth. We agree. We also know that Dominicans are a resilient people. Living in the hurricane belt, they are destined to have additional hurricanes, but with EWB-USA’s engineering expertise and building guidelines they will be much better positioned to withstand future storms.